Rosalía is one of a kind. On a recent trip to Mexico City, a new friend turned me onto Rosalía, a Barcelona-born flamenco singer with a stop-your-heart voice and a breathtaking look. As we drove through the busy streets, he played the 24-year-old’s “Catalina,” an interpolation of an early 20th century classic by legendary cantaor Manuel Vallejo. Rosalía’s visceral take on the song centers her expressive voice amidst a lone, intricately-played guitar. 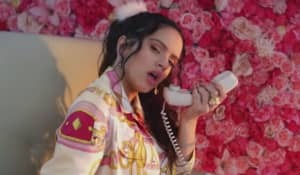 On her excellent newest album, Los Ángeles, Rosalía tethers her knowledge of traditional styles with modern influences in order to, as La Vanguardia put it, “revolutionize flamenco.” The opening track “Si Tú Supieras Compañero” flags her experimental instincts from the jump; it's a union of hushed whispers, gently sighing vocals, and moments of full-throated singing. The album’s sole English-language song is its closer, a heartbreaking cover of “I See a Darkness,” Bonnie Prince Billy’s tortured 1999 ballad. Rosalía collaborates with artists like Madrid trap scene mainstay C. Tangana (who’s also her boyfriend), and has a must-follow Instagram page that's crammed with gorgeous selfies and creative fan art. But my personal favorite thing she’s put into the world is the Los Angeles-filmed video for “De Plata," in which she performs flamenco moves with precision and flair against a series of Instagram-friendly backdrops, like a retro liquor store, and a neon-lit parking lot. It’s a loving combination of tradition and modernity that, to my ear, isn’t quite like anything else around.